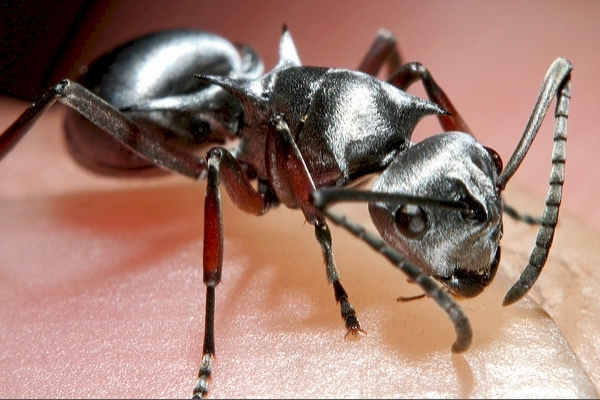 A recent issue of National Geographic magazine described one of the myriad small wonders of planet earth, the tiny silver ant of the Sahara desert. These ants live in areas where temperatures reach over 115 degrees Fahrenheit - as the article described it, an environment "where shoes melt." Because of the extreme temperatures of the Sahara, the ants can only venture out of their underground nests for about ten minutes at a time. They often experience temperatures of 117 degrees and higher in direct unfiltered sunlight. Scientists have discovered that several unique features of the Saharan silver ant's physiology permit it to thrive in such a harsh climate. This ant species has longer legs than other ants, which keep their bodies a small but critically greater distance away from the hot desert sand. They navigate by keeping track of the position of the sun, so that they always know the most direct route back to the nest, thus minimizing their time spent in extreme heat. Their bodies produce proteins that prevent thermal shock. Some other creatures produce such proteins after they come in contact with extreme heat. But since the silver ants only exit the nest for a few minutes at a time - not long enough for the protein to take effect - they produce the protein while still in the nest before they venture out, so they are fully protected immediately. If they did not produce the protein in anticipation of a trip outside the nest, they would die before the protein could take effect. Researchers also discovered that the ants are covered on their tops and sides with a coating of uniquely shaped hairs with triangular cross-sections that act like a tiny air-conditioning system. The hairs are highly reflective under visible and near-infrared light. The hairs also enable the ants to offload excess heat via thermal radiation - much like the heat-transfer process of a household or office air conditioning unit. "Adaptations" Over Long Ages, Or Original Creation? Evolutionists call these wondrous capabilities - as the title of the National Geographic article describes them - "adaptations". They refuse to admit their logical impossibility. Clearly, the species would have died out long before time and chance could have carried out the sprouting of longer legs, their sense of navigation, the capability to produce the internal chemicals necessary to survive outside the nest, or the development of triangular hairs. Creationists, on the other hand, call all of these things the clear evidences of an infinitely wise, omniscient, and omnipotent Creator who spoke the original ancestors of the silver ant into being. He gave them these capabilities even before man's rebellion brought God's curse upon the earth which produced such an inhospitable place as the Sahara desert, and before death in the created order gave these tiny creatures their current food supply, the carcasses of other species. Evolutionists of course vehemently dispute creationists' contentions. Indeed, it would simply be a matter of the creationists' word versus the evolutionists' word if we did not have the authoritative word - the Word of God. Throughout it - from the first words of Genesis to the closing chapters in Revelation - we have the definitive Word of the infinite Word who spoke all things into existence by the word of His power, and actively holds all things together by His word - even down to the incredibly wise design of a tiny desert ant. The question raised by the phenomenon of the tiny silver ant is not merely one of origins, but of eternal life and death. Evolutionary theory is absolutely incompatible with the doctrine of the person and work of the Lord Jesus Christ.